Health and Longevity Politics Global (HLPG or Longevity Politics for short) is happy to present you with our first interview with non other, than Felix Werth, founder and leader of the German Party for Health Research (PfHR), a unique single-issue political party focusing making medical advances counteracting age-associated diseases as its top priority. Earlier we reported that PfHR has finalised its election program for the upcoming European elections on 26th, May, 2019. The success of PfHR on this election might become a watershed moment for all those around the world representing a new, fresh approach for health and longevity politics. Please read Felix’s detailed answers to form an impression yourself. The interview was very slightly edited to ease understanding. HLPG: Hi Felix. Tell us about yourself in a couple of sentences, who are you and how has been your life unfolded so far? Felix Werth: I was born in 1978. After school I did my masters degree in electrical and computer engineering, because I like math and physics. In 2012 I learned, that we have a chance to develop effective medicine against all diseases of old age in the near future. Because I think, that this is so very important, I decided to make it to my life´s purpose to help with this development, because the more people help, the faster we will probably achieve this goal. I switched fields and got a biochemistry degree to help with the research directly. Because I learned how slow the progress in the lab is and because the development of effective medicine against the diseases of old age could be hastened significantly with much more scientists and investments, I decided to do advocacy for more government funding in this area. HLPG: What is the founding story & motivation behind the Party for Health Research? Felix Werth: I wanted to help to hasten the development of effective medicine against the diseases of old age. The question I asked myself was, how I could most effectively do that. There are already non-profit organisations in this area, to which people can donate money to help this research directly and they do advocacy. I decided to also do advocacy, because in my opinion much more advocacy is needed. The more people know about this, the more support the movement will get. I decided to found a single-issue party with others, the German Party for Health Research (German name: Partei für Gesundheitsforschung). The party is not only a very good way to do advocacy, but it also gives people an additional easy option, to support this cause by voting for the party in elections, by giving a support signature for the party’s participation in the elections and by joining the party. One goal of our party is, that the big parties will also include our issue more into their program and they will probably only do that, if they would get votes for that. So the more votes we get the more likely it is, that the big parties will care more about our issue. I have done a petition, that demanded from the German government to invest much more money into this field. But the demand of the petition was rejected by the government with a long justification, explaining, that the government is already investing enough money in this field. Our issue is ignored by most people, both by politicians and by the general public. Almost nobody actively demands more government investments in this field, e.g. there are no big demonstrations for more research against age-related diseases. By doing advocacy, we try to change that. There are several ways we do advocacy with the party. In order to be allowed to participate in elections, we have to collect many support signatures. For the upcoming European elections 4000 support signatures were needed. Collecting signatures gives us a good reason to approach total strangers on the streets and tell them about the importance of our cause. this way of doing advocacy is not very efficient in itself, but with the participation in the elections we can do very efficient advocacy, e.g. before the elections we are allowed to hang up election posters for free, we can air campaign commercials in tv and radio for free, often at prime time, and we get our issue covered by the media. A heartening fact is, that when talking to thousands of random people when collecting the support signatures, almost nobody is against more research in this field and most people agree, that it would be good, if the government would increase the research budget in this area and many thank us for actively trying to achieve that. We have participated in five elections so far, and we had some good successes already. For example, in the Berlin state election in 2016 we had 0.5% of the secondary votes, which are the important ones, even though we are still very unknown. 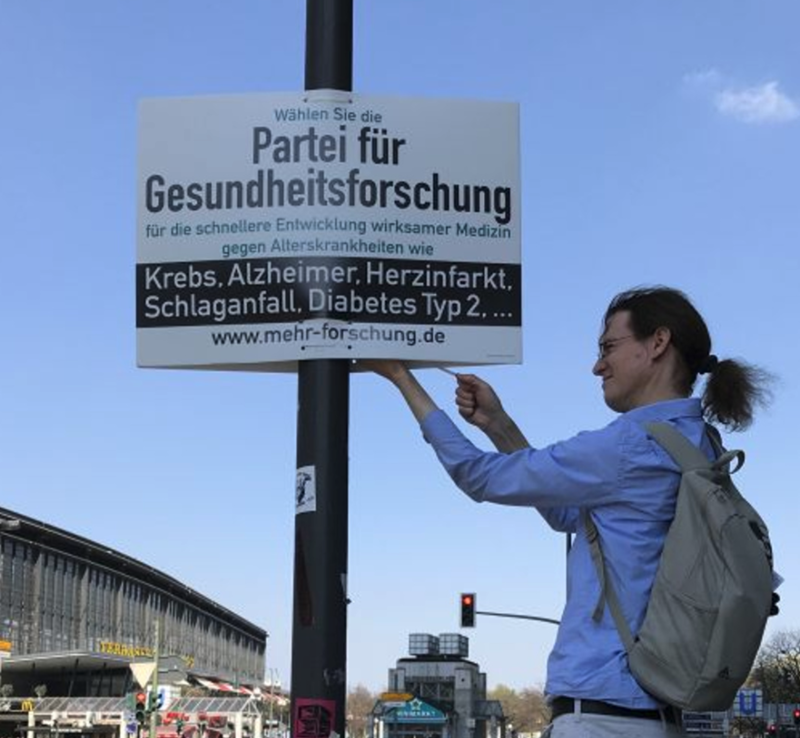 And in the federal election in 2017 in one electoral district, where we hang up a lot of election posters, we had 1.0% of the primary votes and 0.8% of the secondary votes, which was a better result than the well known Pirate Party had in this electoral district. This makes us confident, that our single-issue party has a good potential for further growth. HLPG: Who are the first 200 party members by profession, background, geography? Basically where you are at party building? Felix Werth: We are a very mixed group, because our issue effects each and everyone. We are very mixed regarding age, profession and geography. What unites us is, that we want to hasten the development of effective medicine against the diseases of old age, so that the enormous suffering can be stopped faster and everyone can live a longer healthy life. Everyone can help with that. Our members include scientists and medical doctors, but most members have professions not directly related to our issue, for example actor, business person, bank employee and programmer. We have many young people in our party, who are in their twenties but also older people, who are already retirees and every age group in between is represented. A few of our members already suffer themselves from one or more age related diseases e.g. we have two very active members, who suffer from Parkinson’s disease. HLPG: Why did you choose single-issue politics as the political action to follow in terms of contracting aging-related diseases? What’s your strategy concerning other issues, have you realised already that from your top priority other priorities follow too, downstream? Felix Werth: The government budget is very big and only a small amount of it is currently invested into research against age related diseases. The government could invest significantly more in this area, which would probably hasten the development of effective medicine against the diseases of old age a lot. E.g. 1% of the German federal budget would be about 3 billion euros per year, and for the European elections we demand an additional government investment of 30 billion euros per year in this area. With the additional money more state research institutes should be built and run, the respective departments at the universities should be enlarged and more people should be trained in professions, that are relevant to this field. All other political optimisations will not have the desired effect without this one. Our party only covers this one issue and no other issues for very good reasons. One of our goals is, that the big parties will also include our issue more into their program. And the big parties care about votes. If a small party, who covers all issues, gets 2% and a big party gets 20%, the big party will have no reason to include the demands of the small party more into their program, because they would probably lose more votes than they would win. But if we manage to get 2% with our single issue, the big parties would have a very good reason to include our demand into their program, because almost nobody opposes more research against the diseases of old age, so they wouldn’t lose any votes with that, only potentially win over some of our voters. With a single issue, everyone knows exactly, why people voted for us, and how extremely important our demand is for them. And past elections have shown, that an election result of 2% of the votes with this single issue is very realistic in the future, once much more people know about our party. One other reason for staying a single issue party is, that if the media covers our party, it automatically covers our issue, because we only have this one issue. And media coverage helps with the advocacy. Also most people ignore our issue. That is the reason, why the big parties don´t cover it more, I think. So if we would include more issues into our program, a lot of people, including new party members, would probably focus on the other less important issues and ignore our most important main issue and the original purpose of the party would probably get lost. Also a lot of people don´t know yet, that with today´s technologies and new scientific approaches we have a good chance to develop effective medicine against all diseases of old age in the near future. We use the party to educate people more about this and do advocacy. Covering more issues wouldn’t help with that. We don´t say, that other issues are not important. But other important issues are already covered sufficiently by other parties. HLPG: Somebody at a political gathering stands up and asks your stance concerning ecological awareness/climate change, what are you going to answer? What if they insist that what you are doing is going against a sustainable planet on the long run? Felix Werth: We only have one focus. All other issues we leave to the other parties, because we think, that they already cover them sufficiently. For the last part of the question: I don’t know what the person’s reason for thinking so would be. I would rather think, that people, who have the prospect of a longer healthy life, might care about climate change more. HLPG: What are the main points of your programme for the EU election? Felix Werth: We only have one point: We demand, that an additional 30 billion euros per year of the EU-budget are invested into the development of effective medicine against the diseases of old age. To my knowledge at the moment only about 1 bn euros per year of the EU-budget are invested in the whole area of health research with no aim of the big parties yet to increase this amount significantly. HLPG: What can you realistically expect to achieve at the EU elections? Felix Werth: It all depends on how known we manage to get until the elections. In the Berlin state elections in 2016 we received 0.5% of the votes, even though very few people know us yet. I would guess, that less than 5% of the people know of the existence of our party. So if 50% of the people would know about our party until the EU elections, we should get about 5% of the votes. With 5% of the votes we would get 5 seats in the European Parliament. Also in the EU election there is no threshold, which means, that with about 0.6% of the votes we would get one seat already. And even with one seat we could do advocacy for our cause much more effectively. Unfortunately at the moment still very few people are campaigning for our party and our budget for the election campaign is less than 100 euros at the moment. So any help would be good. HLPG: Do you know about any similar political initiative world-wide? Felix Werth: Yes, there is a kind of similar party in Spain, which was recently formed and also plans to run in the EU elections. They still need to manage to collect enough support signatures though in order to be allowed to participate. HLPG: Do you think putting a more efficient break on age-associated diseases will also help reduce deeply rooted institutional ageism discriminating older people? What’s your take on ageism? Felix Werth: Yes. If old people stay fit and healthy, ageism against old people would go down automatically. HLPG: Thanks for the interview! Nice interview! What’s the name of the Spanish party equivalent to this? Thanks, question to your answer can be recovered from this Telepolis piece, it’s in German. Pingback: An Interview with Felix Werth of the German Party for Health Research – Fight Aging! Longevity Politics, Proudly powered by WordPress.